The spate of legislation also comes after 20 states raised their minimum wages last year and after California and New York both raised their minimum wages to $15 per hour. Critics argue the plan is disastrous and will cost millions of workers their jobs and hurt small businesses, citing statistics and economic impact studies. According to the Economic Policy Institute, 5.3 million workers will have their pay rates increase this year as a result of the numerous minimum wage hikes that went into effect Jan. 1. The institute projects the rate increases will result in an extra $5.4 billion worth of pay, on average $90 to $1,300 per year-round employee, depending on the state. Additionally, 23 localities will also raise their wage rates according to an analysis by the Employment Policies Institute. At the federal level, Rep. Bobby Scott, D-Va., chairman of the Committee on Education and Labor, and 181 co-sponsors, introduced the "Raise the Wage Act." The bill aims to increase the paychecks of roughly 40 million minimum-wage workers by increasing their base pay incrementally until it reaches $15 per hour. House Speaker Nancy Pelosi, D-Calif., said the proposed legislation would expand opportunities for families and spur economic growth. "Our economy works best when it works for everyone, not just the wealthy and privileged few," she said in a statement. Sen. Bernie Sanders, I-Vt., who introduced a similar measure in 2017, said the idea of a $15 minimum wage has become a "grass-roots movement of millions. "It is not a radical idea to say a job should lift you out of poverty, not keep you in it," he said. Not everyone believes raising the minimum wage will spur economic growth. Ryan Young, a fellow at the Competitive Enterprise Institute (CEI), a free market think tank in Washington, D.C., said the minimum wage "is not a free benefit." And it actually increases inequality because it helps some workers at others’ expense, he says. Implementing a minimum wage forces "employers to reduce non-wage pay such as insurance, breaks and personal time off, free meals or parking, and more," Young said in a statement. "A hike in the federal minimum wage would also cause an estimated two million jobs to be lost and hit small businesses the hardest." A 2018 American Action Forum study projected that the minimum wage hikes slated to go into effect this year will kill 261,000 jobs as job creators attempt to keep expenses in line. Over time, the AAF study projects 1.7 million low-end mostly minority-held jobs would be eliminated. As part of the phase-in of its $15 minimum wage, the city of Seattle commissioned the University of Washington to study its impact. In 2016, the university reported that after the state increased the minimum wage to $11 per hour, doing so did not benefit Seattle's low-wage workers. Instead, it had the opposite effect – resulting in modest declines of employment rates and hours worked. This is because, historically, when minimum wages increase, labor participation decreases, the Mercatus Center at George Mason University explains. According to a recent Mercatus Center report, from 1994 to 2014, labor force participation among 16- to 19-year olds fell from 53 percent to 34 percent. 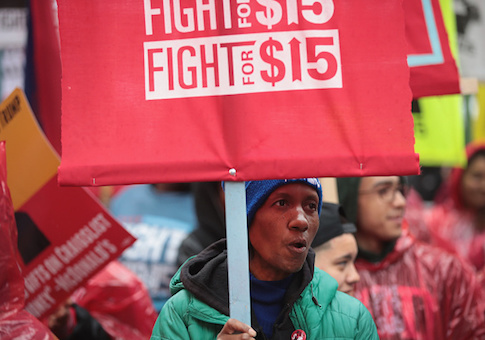 The center attributes the sharp decline to the federal government raising the minimum wage five times over the same time period, from $4.25 an hour to $7.25 an hour, a 71 percent increase. As a result, many low-skilled young adults either lost their jobs or were unable to find employment because higher wages made it less profitable to keep them employed, the study reports. Additionally, "some workers are never hired in the first place, and these willing workers are disproportionately young and minority," CEI’s Young adds. Young also points to a survey of professional economists, which found that they overwhelmingly agree that "a minimum wage increases unemployment among young and unskilled workers." In New Mexico, Republicans are opposing the new Democratic governor’s plan to raise the minimum wage from $7.50 to $12 an hour, arguing such a large increase will hurt small businesses and result in layoffs. During the 2018 lame duck session in Michigan, outgoing Gov. Rick Snyder signed a minimum wage bill into law increasing the $9.25 rate to $9.45, instead of to the $10 rate supported by voters. The move also came after Republican legislators gutted a bill that would have increased the minimum wage to $12 per hour. Last fall, Denver Mayor Michael Hancock hoped Colorado law would be changed to allow cities and counties to raise their minimum wage above the state’s statutory rate. However, legislation addressing this issue never made it out of committee. In his recent State of the State address, Nevada’s governor pledged to increase the minimum wage, saying "no one can live on $7.25 an hour." he told the Current this week however that his priority "is diversify the economy and provide good-paying jobs. "Whatever the minimum wage is it’s not going to provide enough money – if it’s $10, $12, $15, whatever it is, it’s not going to provide enough money for individuals to support themselves and their families," Sisolak said. Instead, he pledged to create jobs that provide benefits and health care so that "someone can support their family."